Jon Golla documents measurements taken in the Valles Caldera as part of his research titled "Surface Water Implication of Valles Caldera Geothermal Fluids on Jemez Watershed." Water from underground hot springs at Soda Dam in Jemez Springs, N.M. has flowed for centuries at Soda Dam creating a buildup of mineral deposits that has formed a unique and spectacular natural dam that blocks the Jemez River. 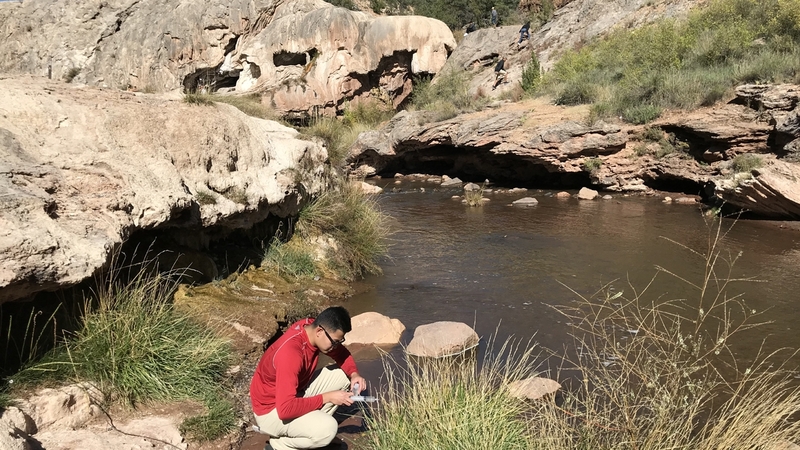 University of New Mexico graduate student Jon Golla conducts his research along the Jemez River in the natural laboratory of the Valles Caldera located in northern New Mexico. 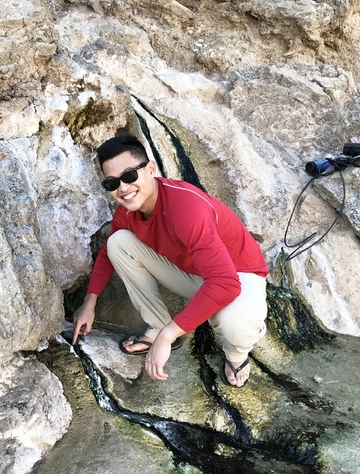 His scientific interests stem from an unfamiliarity with potable water during his childhood and from early exposure to geothermal energy in the Philippines, so the opportunity to work on the waters associated with the Valles Caldera Geothermal System was part of what drew him to graduate study at UNM. Golla’s research focuses on his passions involving aqueous geochemistry and geothermal systems. Through this research, Golla is gaining a better understanding of the proximal and distal hydrogeologic influences of Valles Geothermal System on the upper Jemez River. He received a $6,000 grant to help fund his research titled, Surface Water Quality Implications of Valles Caldera Geothermal Fluids on Jemez Watershed: A Holistic Hydrogeochemical Investigation as part of the Student Water Research Grants program through the New Mexico Water Resources Research Institute (NM WRRI). John Golla conducting research in the Valles Caldera. Golla specifically focuses on the natural trace element salinization of the Jemez River. Shallow magmatic activity provides heat to the system and creates a natural convection current of geothermal waters, which are usually mixtures of deeply derived fluids and infiltrating precipitation. These circulating fluids become much more saline than other natural waters (i.e., river, groundwater, etc.) because minerals in rocks are more readily dissolved at higher temperatures. Such saline waters are expressed at the surface of the iconic Soda Dam and Jemez Springs as springs, which discharge into and impair the water quality of the Jemez River. His research goals as part of the project include discovering how these dissolved species are introduced into the system, which is marked by elevated concentrations in the river; how far downstream this geothermal signature is carried; and which processes (i.e., dissolved species captured by or transformed into solids) are potentially responsible for removal in-stream. The research group collects multiple water samples along the study reach to provide a continuous spatial mapping of geochemical behavior. Golla’s research builds upon previous knowledge published by Los Alamos National Laboratory scientists and extends the suite of measured dissolved elemental species by including metals (like arsenic, lead, and uranium), which are usually found in trace amounts in natural waters but are more abundant in the inflowing thermal spring waters due to enhanced water-rock interaction at depth. 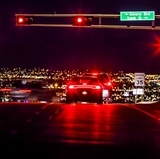 This study also supplements the New Mexico Environment Department’s recently approved Total Maximum Daily Load development and the U.S. Environmental Protection Agency’s ongoing New Mexico Water Quality Management Plan. The NM WRRI provides support for water-related research through its Faculty and Student Water Research Grant Programs. Funds for the Student Water Research Grant Program are made available through the institute’s state appropriations. 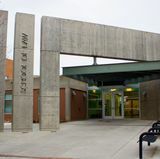 The funded projects allow New Mexico university faculty and students to pursue critical areas of water resources research while providing training opportunities for their students. 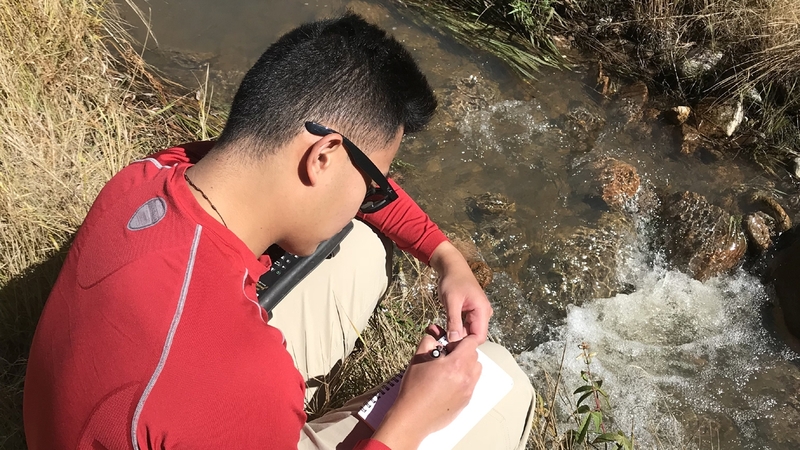 NM WRRI Student Water Research Grants are intended to help students initiate research projects or to supplement existing student research projects in water resources research. The research grants usually fund expenditures for student salaries, supplies, sample analysis costs, field equipment, travel to field sites, and travel to present results at professional meetings. 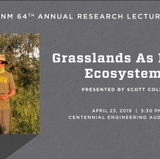 Student grant recipients prepare final project reports that are posted on the NM WRRI website at: https://nmwrri.nmsu.edu/student-water-research-grant-program/.